In a Best States survey, Minnesota holds the number two spot overall. The Upper Midwest state ranked high for opportunity, healthcare and quality of life, with scores of seven, three and two respectively. However, Minnesota didn’t do so well on the financial front: ranking 20th for economy and 24th for fiscal stability. This may come as a surprise given that the Northstar State is known for its diverse economy and is ranked 17th in the nation for a gross domestic product of $351.1 billion. Moreover, a significant number of top US companies including General Mills, Target, Ameriprise, and Best Buy choose to headquarter here. The agricultural sector remains a major part of the state’s economy, with Minnesota producing most of the country’s sugar beets, sweet corn, green peas, and turkeys. Logging and paper production also contribute to the state’s wealth. Minnesota’s median household income was $65,599 in 2017 which is higher than the US average of $57,617. Of course, “median” means that while half of all residents enjoy an income above that figure, the other half unfortunately makes less. If you fall into the latter category and have a hard time making ends meet each month, you may be growing debt instead of savings. Many Minnesotans have to use credit cards to buy basic household essentials—it’s not an uncommon scenario. And if this is the case for you, you may only be making the minimum payments on your cards each month or you may even be skipping payments altogether some months to take care of other bills. While debt consolidation is a good choice for many Minnesota individuals, it may not the best debt-clearing strategy for you. Visit Freedom Debt Relief or call 800-910-0065 for a free debt evaluation to find the smart solution to your debt. 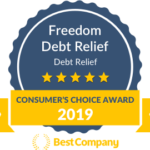 The highly trained debt consultants at Freedom Debt Relief will even go so far as to recommend another company if they feel that you would be better served by them! If you’re concerned about your levels of debt, you’re not alone. Many of your fellow residents are in the same position. In 2017, on average, Minnesota residents held three credit cards with balances of $4,541. While this is nine percent less than the national average, it’s still cause for concern if you’d rather be saving money instead of amassing debt. In the Gopher State, creditors have 6 years to sue consumers who are unable to pay their debts. After that time, the debt does not need to be paid back, but they may still try to get some of the money owed. Rather than trying to avoid your creditors and collection agencies (think phone calls and letters), which can add worry to an already fraught situation, take charge of your financial destiny now. If you’d prefer your finances to be in the black as opposed to the red, start looking into debt resolution today. Whether it’s debt consolidation or another method, you’ll gain peace of mind by knowing you’re headed in the right direction. All you have to do is make that first call. Contact Freedom Debt Relief now at 800-910-0065 for a free debt consultation.